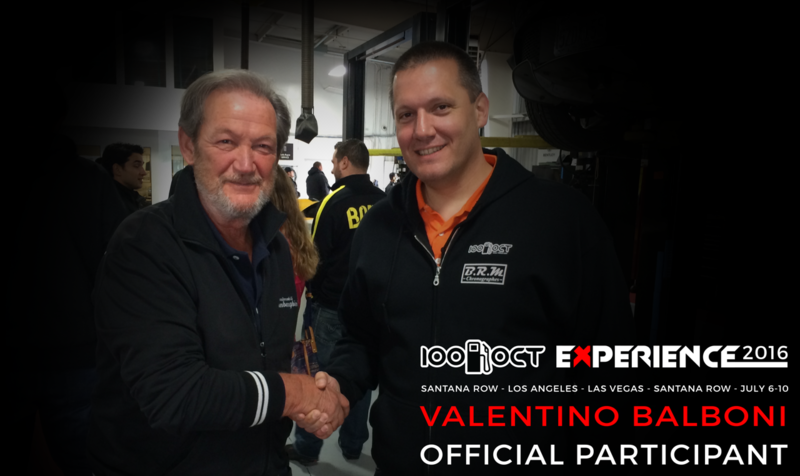 100|OCT today announced that Valentino Balboni, former test driver for Lamborghini Automobili, has signed up to participate in the 100|OCT Experience 2016, the best luxury road trip in the American West. The 100|OCT Experience 2016 will take exotic and super car owners on an amazing journey through the American West from Wednesday July 6, 2016 to Sunday July 10, 2016. It is not a rally where you have to drive as fast as possible from one point to the other. Rather it is an enjoyable and luxurious road trip through breathtaking scenery on great and rarely traveled roads. The 100|OCT Experience 2016 will start from Santana Row, a high end shopping district in San Jose, California on Wednesday July 6 at night, and reach Las Vegas, Nevada on Saturday July 9 in the afternoon. Participants will stay in the most luxurious hotels and dine in the best restaurants every night. Valentino Balboni is the former chief test driver of Lamborghini, a manufacturer of exotic cars in Italy. He retired in October 2008 due to Italian government work regulations, after having served the company for 40 years. 100|OCT (pronounced "hundred octane") has been organizing automotive lifestyle events in the San Francisco Bay Area and beyond for the past 4 years. Their 100|OCT Cars and Croissants at Santana Row gathers over 100 exotic and super cars and an average of 5,000 fans every month.